We’ve had our first big rookie changes at the selection table and we have some underperforming premiums to deal with this week…. It’s All Happening! Let’s Scramble! Aaahhhh How good is it to be back on Friday! It is like slipping into your favourite chair and sitting back to watch the footy with a Frothy or a Wine in hand. Anyway, back to reality…. Another week and more issues to deal with. We have two rounds in the books and both weeks so far have had some sort of issues to deal with for coaches. But this is what makes this game so much fun! Right?! Well that is what we are here for, to try and get you through some of these more difficult decisions. Two weeks can often give you some conflicting data but you need to look through all that and take a balanced view of it all. So, with that in mind. It is time to Scramble! If you are a player of these forms of the game then this is one of the most crucial weeks of the season. This week not only sees the beginning of the head to head matches in leagues, it also sees the first week of price changes. So if you play these games and you have missed out any rookies or have an injured premium that will be out for a while like Ryder or Matt Crouch, you can trade them out this week without having them lose any value. Make sure that you are careful with your trades as they are limited to 30 so sideswapping of a ‘slightly’ under performing premium like Hibbo is probably something you don’t want to be doing. I try use the trades this week to make sure that I have gotten my rookies right, that is one of the most important things you can do (after fixing up a long term injured player). Is Two weeks enough Data? This is something that we all ask ourselves. Some players we hung last week and vowed to get them out, but then they bounced back and similarly some were fantastic last week but no good this week. It is this that makes me hold on to players rather than trade them out on a whim. Take for example Aaron Sandilands who had a fantastic game in round one and many said they all knew he would be great, but then he had a very quiet game this week. How do we read that? Well it is hard to. But what I am trying to say here is, don’t just jump on or off after two weeks of mixed data. However, there are others that we can make a call on. Like the boys said in the podcast from Monday night, unfortunately our favourite Pig, Rocky, has to be traded out. This is due to a change in role and team. Similarly Sam Menegola has had a change in role with another big dog coming into that midfield. For these reasons you can make the call on these guys. Now, let me be clear, this doesn’t mean they won’t come good. But, we can’t afford to hold them at the moment. If they do turn things around you can pick them back up again when they bottom out in a few weeks time. As with all trades there is an element of risk. If you have sound research behind your decision then you can’t be upset with yourself. Just like trying to predict when Jarrad Waite is going to have a massive game like he did on the weekend, it is impossible to get it right every time. Matty Kreuzer – The great thing here is that we will know before lockout whether or not he is playing even though he has been named. Whilst most people in AF would have traded him out last week, if you held him and he misses again this week you could consider moving him out only if you have no other issues with your team. Odds are that he won’t be moving that freely and could have his time limited when he returns. If he is out and you held in SC and RDT and have cover you may want to consider holding for one more week as you just don’t want to use trades on a sideways swap unless it is a known long term injury. Even if he comes back slowly it is still better than a trade. Rookies that miss this week – This is one of the most annoying things about this game, you select the rookies that you are expecting to be good and make you some money and then their coach doesn’t select them (can happen with other higher price players too…. Thanks Horse!). If you have a rookie that doesn’t get selected this week, you need to look more at who has come in for them. If it is a regular best 22 player that has returned from injury or suspension then you may want to offload them, particularly if their BE isn’t low. On the other hand, if they are just being rotated with another rookie and they have been rested and they have a really great BE then I would look to hold them for another week or so because they may come back in after a week out. Obviously this is format dependant a little bit too as we don’t want to waste trades in RDT and SC with heaps of sideways swapping. Trading out with a view to a return – So I have just talked about swapping your rookies around. Just beware that you can’t always slot them back in again easily. Who knows what will happen next week or the week after, you might get hit with some other injuries that take your ability to trade the other guys away because you have bigger things to focus on. This is the same throughout the whole season. If someone is just missing one or at most two weeks and they are a high price player (think Danger or Titchell) then you may need to use cash elsewhere on injuries in the forwards or backs which then prevents your plan to get these guys back in again. It is just risky to do this and it isn’t advisable. Sic Dawg (did I get that right Roy?) – Heaps of you want to know what to do with him. Personally I didn’t start with him. He will only be missing for one week and we know he is fit so holding him is a perfectly sound strategy. However, if you are concerned that this could be a regular thing then trading him out may be the way to go so you can get a good night’s sleep occasionally. In terms of who to trade to? Well I think Bonner is the first one that I would look at if you don’t have him. His role seems pretty set. I am not confident that Pittard walks back into that best 22 at the moment. Bonner uses the footy better than Pittard and is just as athletic. I wouldn’t go right down to a basement rookie. My preference would be to trade another high price rookie like a Dow or Rayner down to a basement one and then use that cash to upgrade Sicily to someone else down back that is a little more stable with their scoring. As we expected there were a few omissions that will affect us this week. Here are a few thoughts…. Mason Cox is back so this is a massive concern for Brodie Grundy owners. In that same game we see Matty Kreuzer back but as I said above, just check the late outs on Friday as we will know before lockout whether he is in. As a few of us thought, Cam O’Shea is back out again. This is enough for me. Unless there is a long term injury in the Carlton backline he is not a valid option. Zac Langdon is out for 4 weeks with his busted hand and Matt Crouch is out with his Hammy. But importantly, Darcy Fogarty is out now that Tom Lynch returns for the Crows. In that same game we see Hunter Clark out and Nick Coffield makes his debut. I think Hunter was a trade out anyway this week. As for Coffield I am sceptical but in AF if you need to trade out another rookie like Naughton you could take the chance on him. In SC and RDT just wait for a couple of weeks on him. Another debutant this week is Jack Higgins from the Tigers and we have David Mirra from the Hawks is also in his team’s extended squad. Similarly Brayden Ainsworth is also on the extended bench for the Eagles. Not sure about Mirra or Ainsworth making the cut as I haven’t heard anything about them but we have already heard from Dimma that Higgins will be playing. No Partial Lockouts this week in AF and RDT. Sides are LOCKED at the start of the game tonight. In RDT and SC it is the time to get your rookies right. Prices start to change as of the end of this round. Head to head games start in RDT and SC this week as well. You won’t get your rookie on ground selections right each week, so don’t stress, most people would go the same way. Back to a regular round of footy this week so you can set your lineups tonight then sit back and relax. So remember there is no loophole option either. 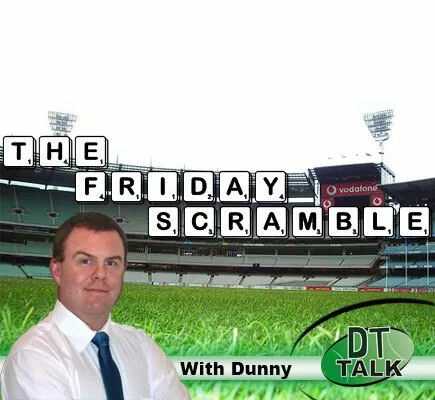 Best of luck with your teams this week and I will catch you all again next Friday morning. Cheers Dunny. JOM to Taranto OR Zerret to Whitfield? My second trade will be Hibberd to Ryan. I am holding James Sicily this week. Neither. JOM won’t lose money and Zerrett is a keeper. Play for total points at end of season and have never heard of a 1 wk hammy so concerned about Duncan long term, and we have all seen hibbo. Only other issues are sic dawg (can be covered for 1 wk by naugton) and Langdon (covered by Waterman). Check this stat out – Only one StK player has more career hitouts than Sam Jacobs has from the first 2 rounds (63)! Josh Bruce -just- with 85 from 76 games. Next best is Seb Ross with 51 from 83 games. Their nominated ruck – Rowan Marshall has just 5 HO from his only game.